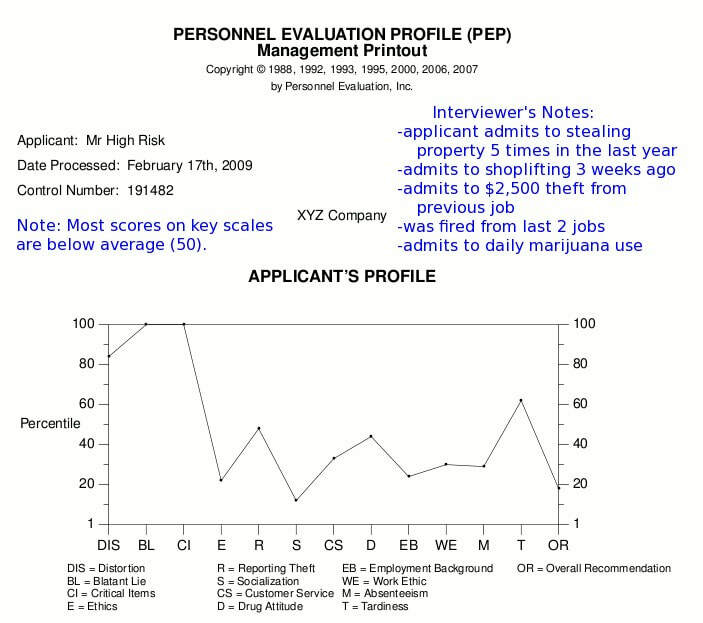 The Personnel Evaluation Profile (PEP).... when Integrity is essential to successful job performance. What do the PEP scales measure? Help you catch untruthful applicants and those that answer unrealistically. Identifies problematic values or background behaviors that are often disqualifying. Identifies applicants with weak values regarding truthfulness, taking advantage of situations, and leniency towards dishonest behavior. Identifies those that will not report dishonest behaviors and those that might place friendship over truthfulness. Helps identify problematic people skills, including: problems getting along, patience and tolerance issues, empathy and being overly self-centered. Helps identify those that don't understand the importance of meeting the needs of customers and don't have the right temperament. Identifies current drug users and those with leniencies towards illegal drugs that are not consistent with law enforcement. Identifies applicants with problematic behaviors in their employment history such as rule breaking, disciplines, terminations, and performance issues. Identifies applicants with poor work attitudes, lack of longevity at jobs, lack of desire for the job, and lack of loyalty to employers. Identifies applicants with leniency regarding absenteeism as well as those with past absenteeism problems. Identifies applicants with leniency regarding tardiness, as well as past tardiness problems. This scale compares answers on key questions to thousands of prior applicants. This scale also helps identify which applicants are most likely to successfully complete your background investigation. Results are presented in an easily understood "graph" format comparing the applicant to norm groups. A 3-7 page report provides explanation paragraphs and a "detailed breakdown of survey responses" section. The detailed information provided allows interviewers to focus their interview and background investigation to disqualify bad applicants sooner in the process. One of the most popular aspects of the PEP program is our Verbal consultations. Our experts will call to review the results and provide suggestions for follow-up questions in the background investigation. This part of our service has saved our clients thousands of hours of backgrounding time. When you are screening multiple applicants at one time, we can provide you with a free ranking report. This report can be used to help you quickly identify which applicants are most likely to pass your background investigation. When the applicant takes the PEP, our system automatically searches to see if they have ever taken the profile before for your agency. We then provide a consistency report details any noteworthy changes in their answers. Sometimes the applicants lie and the noted differences are disqualifying. There is no extra charge for this service. The Share Program is an expansion of the Consistency Report. Law enforcement applicants often apply to multiple agencies. In doing so, they may take the PEP more than once. If the applicant takes the PEP multiple times, they may score better on later tests due to practice/feedback rather than a true change in their value system. By participating in our Share Program, you will be provided with a consistency report detailing any noteworthy changes in their answers. Sometimes these differences lead to disqualification. There is a small additional fee for using the Share Program and it requires our signed release by the applicant. The delayed scoring option allows you to test an applicant pool at any stage of your process, but the tests are not scored automatically. At a later point, you can select those applicants that you wish to move forward with in the hiring process. You only pay for tests you decide to have scored. Those tests that are not scored will be held in our archives and may be scored at any point in time, which can be extremely helpful if the applicant ever re-applies. The PEP survey questions are simple, self-explanatory, and written in a forced-choice format: True-False or Yes-No. This format was intentionally used to eliminate the applicant's tendency to choose a neutral response. The on-line version is slightly faster for the applicant and results come back to you more quickly. In addition, the system identifies any unusual delays when answering questions and whether the applicant went back and changed any responses. If the applicant takes the paper and pen version (Scantron), you can scan the answer sheet and email the file to us, or simply fax it in to us. Scanning typically has less skew than faxing and emailing will give you a faster result. results via email within 2-3 minutes, allowing you to make data driven hiring decisions.